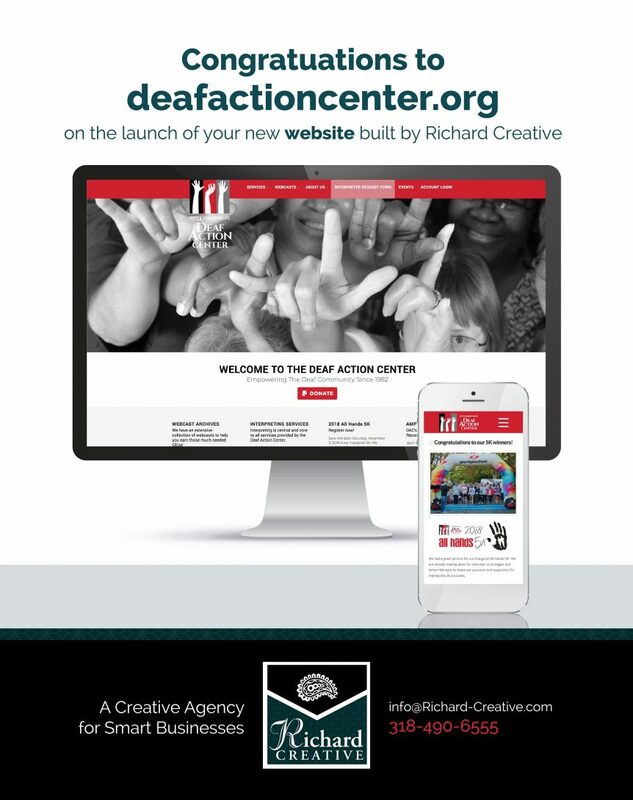 Richard Creative recently had the honor of designing a new website for the Deaf Action Center – a wonderful nonprofit organization that serves the deaf community in Shreveport-Bossier. Founded by Betty and Leonard Phillips and their families, the Center works to eliminate any and all barriers and, in fact, serves as a beacon and source of unity for all persons affected and touched by hearing loss. By strategically combining and editing the content, we streamlined the pages and created digestible, useful information in a reader-friendly layout. We updated the look of the site with a clean, modern palette inspired by their new color blocked logo – black, white and gray, with pops of red. We are thrilled that the Deaf Action Center has a functional, practical way to connect members of the community to their resources and events. Visitors can access information about interpreting services, sign language classes, webcast archives, purchase tickets to events, and much more! Visit the website at deafactioncenter.org, and support this wonderful organization!